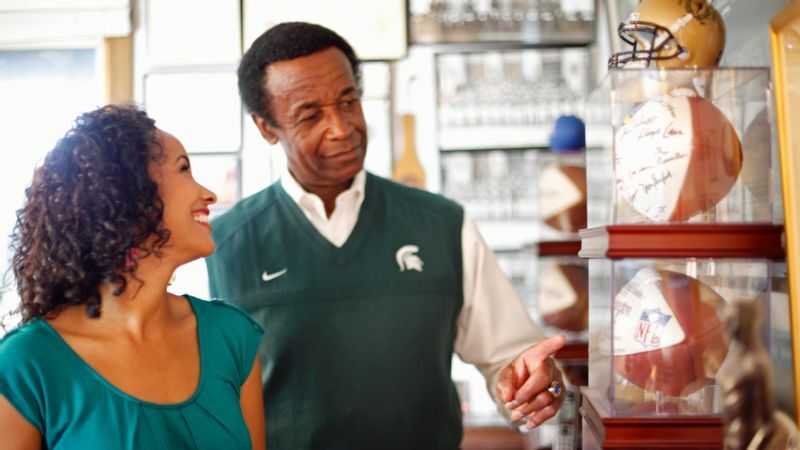 Maya and Gene Washington amid Michigan State memorabilia in East Lansing. In the spring of 1963, Gene Washington sat in his La Porte, Texas, living room listening to Dan Boisture, a Michigan State University football coach, make the case for why Washington should join the team. At the time, Washington wouldn't be allowed to attend any of the major universities in Texas during the era of segregation. His education would be covered with a full athletic scholarship at Michigan State. Duffy Daugherty, the Hall of Fame coach who'd been conducting clinics around Texas, had heard good things about Washington. Washington remembers this day not only for how it changed his life, but because it was the first time a white person had ever set foot in his home. In quick succession, he experienced a series of firsts as he headed to Michigan: riding on an airplane, entering a restaurant through the front door, living with and making white friends. Once in East Lansing, he and the other black members of the team -- Bubba Smith, George Webster, and Clinton Jones -- would comprise the first fully integrated lineup in Michigan State history, going on to win the National Championship in 1965 and 1966. The following year, they were drafted into the NFL in the first round, all while the civil rights movement blazed around them. For all the elements of historical and cultural significance that Washington's story offers, there's one person who was mostly unaware of it: his youngest daughter, Maya. Growing up in the suburbs of Minneapolis in the 1980s and '90s, long after her father's career with Michigan State and the Minnesota Vikings had ended, she remembers having the inkling that her dad was somebody -- she just didn't know who. "In the community, he'd say hi to people, or people would say hi to him, and I remember saying, 'Do you know them?' and he'd say 'No.' But now I realize, maybe people were recognizing him," says Maya. It wasn't until August 2011, when Washington's friend passed away, and Maya joined her dad at the memorial in Los Angeles that she began to connect the dots of what it meant for a young black man to leave small-town, segregated Texas to join a northern, integrated Big Ten football team in the 1960s. With her curiosity piqued, she began the journey of learning more about her dad and telling the story of how Daugherty, Smith and others helped change not just the course of her family's life, but the racial demographics of football. Her documentary on the subject, "Through the Banks of the Red Cedar," is now in postproduction as she works to raise the money to finish and release it next year. Originally, she'd intended the film to be a story about civil rights, education, and opportunity for a group of talented young men from the south. But as she learned more about her dad, and spent more time with him than she had, she says, since elementary school -- the two of them grew closer. Onscreen and off, she began to explore the growing bond their conversations had sparked. With Washington's talents in athletics, and Maya's in the arts (she's an actress, writer, and filmmaker, with a history in dance and theater) they didn't share much, and their relationship had long been stunted. Maya remembers a time in elementary school when he picked her up early to attend a Michigan State vs. Minnesota Gophers basketball game, and how irked she was to be taken out of class. "I think any other kid would have been ecstatic to get pulled out of school to go to a basketball game," she says. "I just remember being more excited about what the cheerleaders were doing." And though all three Washington girls made temporary forays into athletics, none of them pursued it with the fervor their dad once had, and of course, none of them played football. She says her dad didn't explain to her how the game worked, nor did he talk much about his life in it. "I don't know if it didn't occur to him to tell stories, or if it didn't occur to me that he had any stories," Maya says. "But it never came up." But elements of her dad's legacy were all around her. She remembers a room in their house filled with trophies and memorabilia from his football, baseball, basketball, and track careers: Washington was a two-time NCAA All-American in football and still holds NCAA records in hurdles. (Maya played with Barbies in that room). Mostly, she remembers how her dad tried to impart his work ethic to her and her sisters. The familiar imperative was to be "twice as good" as her white peers, which was compounded by being known as both "Gene Washington's daughter" and "the black girl at school." "In a lot of those spaces that were predominantly white, you had the pressure to represent almost the entire race -- to run faster, work harder, to be the best. It's a great motivator, and I'm grateful for some of the things I've been able to accomplish. But it can be a lot of pressure." For Washington, as with so many blacks from his generation, he had no other option but to be the best. While at Michigan State, he played football, indoor and outdoor track, and attended summer school each year. And once he'd begun playing for the Vikings, he attended graduate school during the offseasons, and worked a full-time job, heading straight there after practice each morning. "The most important thing to me while I was at Michigan State was to make sure I did my academics, because I didn't have anything to fall back on," he says. "I had something to prove -- that I could make it in an integrated environment." Father and daughter pose with Gene's No. 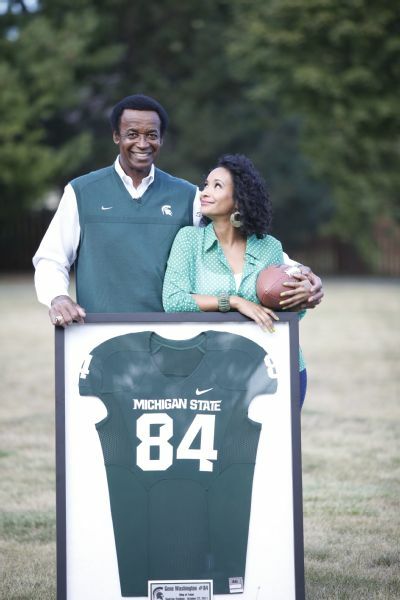 84 jersey on the Michigan State field. But most important to him is being the first person in his family to earn a college degree. It's an opportunity his parents, who only attended school through the sixth grade, didn't have. "Knowing that my dad had left segregation for this better opportunity at Michigan State was always something I was aware of on a surface level, but never [considered] what doors opened for me, and how much responsibility I had, because I was given the opportunity to get an education." Learning about the circumstances of her dad's civil rights-era education also elucidated for Maya some of her dad's more "square" qualities -- not drinking, smoking, or swearing; his healthy eating and regular exercise. And as she got older, she realized that what she had always perceived as his tepid response to her artistic interests was probably just everyday parental exhaustion. "When he would [come to my performances], a lot of times, if I could see him from the stage, he'd be falling asleep," she says with a laugh. "But he was coming to these concerts after the end of a long work day." Once she let go of the romanticized father-daughter relationship she'd grown up watching on TV, she realized that even without common interests, it was still important to try to connect. That point of connection, for her and her dad, has become this film project. "We have conversations that aren't just about the weather," she says. "I've gotten to know some of the players at Michigan State, and I can ask him about what's happening with the team. We actually have something in common. That's huge." And, she believes, having her dad witness the challenges of independent filmmaking and her determination to complete "Through the Banks of the Red Cedar" has given him a greater understanding for what she does. "We both have an appreciation for each other that maybe we wouldn't have if we hadn't had this experience," she says. "That's worth everything." Kyla Marshell is a creative writer based in Brooklyn, N.Y. Follow her on Twitter @kylamarshell.